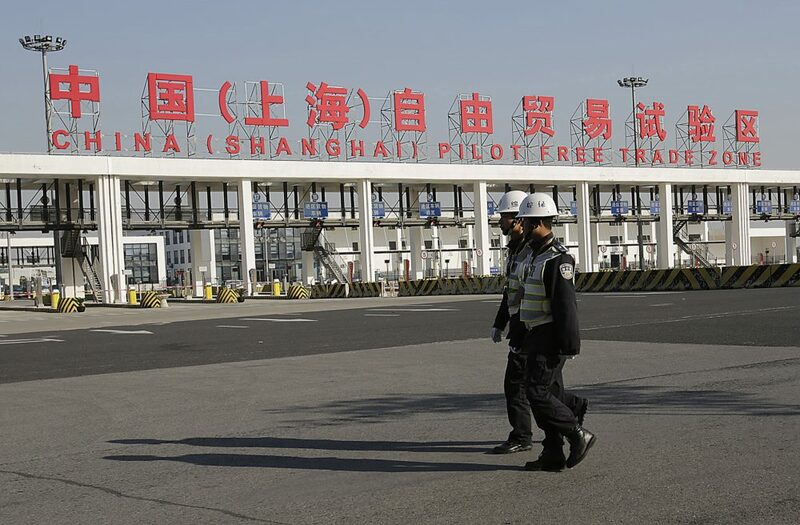 Security guards patrol the main gate of the China (Shanghai) Pilot Free Trade Zone at the Pudong International Airport in Shanghai, China, Nov. 29, 2013. The free trade zone was launched to free up cross-border commodity and capital flows in the world’s second largest economy. Photo by Eugene Hoshiko/Associated Press. Ideas, innovation, exploration, and entrepreneurship make societies rich. When you buy something built elsewhere you are not just buying a fancy new object. You are importing ideas and innovation. When we welcome traders and merchants, with their wares and goods they exchange with ours, we trade not just goods and services, we open our minds to new ways of doing things—doing it more efficiently, more economically, and sometimes more aesthetically—breeding entrepreneurship. When we work with scientists, religious scholars, political thinkers, chefs and artists from other lands, we transform and enrich our minds as we transform and enrich theirs in the process. This is how societies have progressed over many centuries: from Silk Road traders traversing the Middle East to Asia, to explorers crisscrossing from the Old World to the New World, to the millions of students who flock to the United States to attend college and graduate schools. Free trade has freed us from the tyranny of our own narrow ideas and ways of living. The movement of peoples across national boundaries has transformed religion, technology, and political thought for many centuries. Now, free trade and the free movement of people is under attack. In Trump’s America, coinciding with Brexit and perhaps with an impending “Frexit” from the European Union, many of us are wanting to crawl back into our shells, hoping the distance that we create, both economic and cultural, will protect us from the dislocation, and redistribution of wealth. 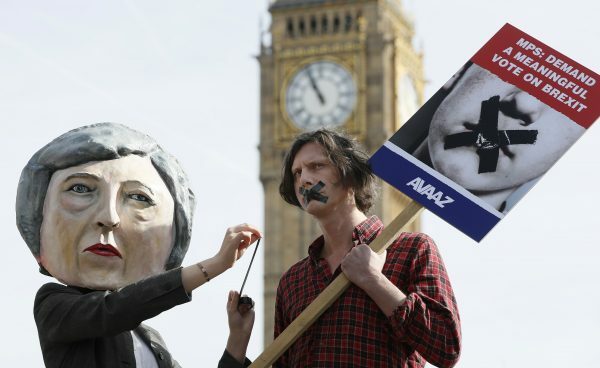 Demonstrators, one dressed in a Theresa May puppet head, pose near parliament in London, March 13, 2017, to express their concern that the Prime Minister is whipping members of parliament to endorse a “blank cheque Brexit.” Photo by Kirsty Wigglesworth/Associated Press. The forces of technology have always been powerful and are likely to become even more so in the future. Robots carry no passports and don’t need visas to invade our shores. Artificial Intelligence (AI) does not even need to travel by sea, air, or land. It will arrive on our computers, tablets, and smartphones while we are asleep. So factory workers in Detroit or Ohio should no longer be worried about the threat of exported Chinese, Japanese or South Korean manufactured goods. The real threat comes from factories that will be largely run by robots, and the tsunami-like advance of AI. Is it not our moral duty to protect those who are deeply hurt by free trade, immigration, and, now, by the ever-accelerating free movement of technology? Of course it is. But our focus should be on protecting workers, not old jobs or dying industries. The best way to protect workers is to make them ready for the new, ever-changing world we live in. Endless cavalier talk about job retraining can sound patronizing. It isn’t easy to learn new trade or skills, especially as one gets older. But there are fresh ideas worth considering about how to protect people and help them to adapt, and at least a few of these are worth trying. First, even if we cannot re-train ourselves so easily, we certainly can make sure that our children are equipped to navigate the new world with more agility and ability. This means making sure they receive a modern education. How do we make sure that education remains affordable and within reach for all, especially those being displaced? The forces of technology have always been powerful and are likely to become even more so in the future. Robots carry no passports and don’t need visas to invade our shores. Here’s one idea: When a worker is laid off, we should do more than simply protect her basic needs by providing unemployment insurance and other social security benefits. We should also offer her vouchers that allow her to send her children to school, college, or vocational training schools; the voucher could cover her own education if she is so inclined. Second, we can make unemployed workers eligible for micro-finance loans that encourage them to start a small business of their own. Entrepreneurship is not a panacea, and is still riskier than having a stable job, but society can help shoulder the risk of failure with them. Third, we must now embrace the idea of Universal Basic Income (UBI) to make sure that no one is hungry, without adequate healthcare or a roof over their heads. Such guarantees need not add to the taxpayers’ burden if we reallocate the existing transfers and subsidies that have favored the upper middle-class and the rich. We can begin by targeting agricultural subsidies and the tax-deductibility of corporate debt and mortgage interest. Of course, entrenched interests will fiercely oppose such moves. But the Trump-led transformation into a protectionist and parochial society, if enacted, would be far worse. We can ignore a thousand years of history only at our own peril. Bhagwan Chowdhry is a professor of finance at the UCLA Anderson School of Management and co-founder of the Financial Access at Birth initiative. This essay is part of an Inquiry, Does Global Trade Have to Be a Zero-Sum Game?, produced by the UCLA Anderson School of Management and Zócalo Public Square.